Is Amtrak a business or a public service? The difference is far from trivial. It reflects fundamentally different approaches to preparing America’s transportation system for the 21st century. 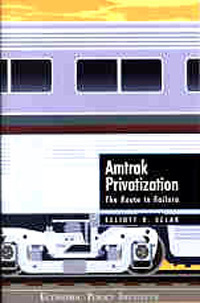 This book makes the case that passenger rail service is crucial to the nation for economic, environmental, and national security reasons, and that the core of our national passenger rail policy should be to facilitate investment in advanced technologies that will improve passenger rail performance and enhance its appeal as a transportation option. Current proposals to privatize Amtrak rest on hopes that its operating deficits can be eliminated. But privatization will not cut these deficits unless it shrinks passenger rail service. And far from yielding more efficient operation, privatization will make Amtrak more cumbersome, as Great Britain’s failed experiment in national rail privatization and reorganization has made clear. Instead of withdrawing public investment in the nation’s passenger rail service, now is the time to formulate a forward-looking passenger rail policy, building on the strengths of Amtrak in order to improve the performance of the U.S. economy as a whole.